local cask ales on offer. Restaurant (c32 covers) with elevated conservatory extension, portable hot deck/carvery with magnificent views of the surrounding area and the delightful al fresco garden below. 6 delightful en-suite letting rooms. Lovely enclosed grassed and flagstone al fresco garden area (circa 70+) ; Smoking solution. Advised turnover of circa £181,016 (incl.VAT) to end 31st March 2018 achieved on a trade split of 85% Wet sales: 9% Food sales: 6% Accommodation. A fantastic opportunity to purchase this substantial inn offering many untapped opportunities. 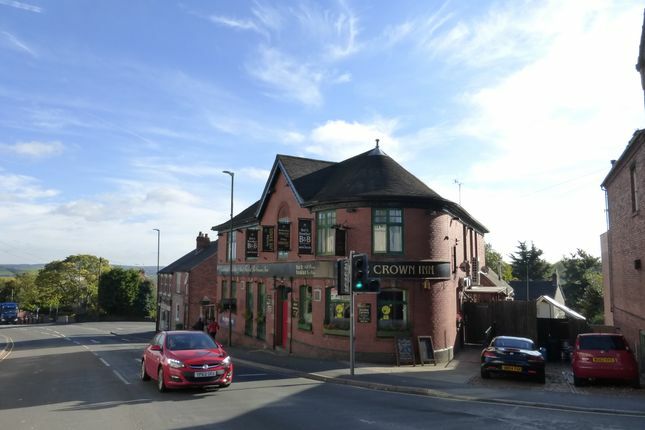 This traditional inn is located in the bustling and populous Derbyshire market town of Heanor only 8 miles from Derby and a stones’ throw away from the Nottinghamshire border. Heanor has a vast array of shops, facilities and amenities and there are many schools in the town and surrounding areas. Nearby points of interest include Codnor Castle and Shipley Country Park and the tourist’s paradise that is the Peak District National Park is only a short drive away. The nearby road networks are excellent and the M1, A38, A52, A6 and A610 are all accessible. Open plan Bar area (c70+ plus standing) is a spacious and well-presented air-conditioned room with a warm and welcoming atmosphere. Loose tables and assorted chairs and stools are all complimented by upholstered perimeter bench seating. Areas of carpet and ceramic tiled flooring create a good-sized drinking area and there is an elevated stage area in one corner. 3 x hdtv’s and a big retractable screen with projector enable live sporting events to be shown throughout and there is also a darts throw, juke box and 2 x awp’s. There is a central bar server of wood construction with 6 local cask ales on offer and even a piano sat to one side waiting to be played. Restaurant (c32 covers) is a delightful self-contained room to the rear of the property with an elevated conservatory extension providing lovely views of the surrounding area and the beer garden below. Loose tables and chairs sit on a ceramic tiled and carpeted floor with a portable hot deck/carvery in the corner. Double doors lead out onto a balcony area with stairs that lead down to the lovely al fresco garden. There is a fully equipped commercial Catering Kitchen with stainless steel appliances and surfaces (equipment not tested). A dry goods storage area leads off. Below ground floor Beer Cellar with14 cask tilts, python system, remote and storage areas. Ladies, Gents and disabled wc’s. The owners’ accommodation is situated on the first floor and consists of a 1 double bedroom bedsit with shower room. The original owners’ accommodation was used to create the en-suite letting rooms however could easily be converted back if desired. Obviously, this would reduce the letting room options. To the side of the property are c5 tandem parking spaces used mainly by the owners. On the 1st floor of the property are 6 delightful and well-presented en-suite letting rooms (1 family/3 double/1 twin/1 single) all with tea/coffee making facilities, wifi and hdtv. To the rear of the property is a lovely grassed garden with a central block paved pathway and elevated flagstone patio area. The garden has wooden picnic tables and wooden benches (circa 70+) and established shrubbery borders. To the side of the property is a covered smoking solution. The property and business are being offered for sale freehold (although we have not had sight of the title deeds). We are advised that all available mains services are connected (no services tested). Business rates payable are advised as being circa £250 per annum to include relevant reliefs. The current owners purchased the freehold property in 2010 and have since created a desirable business offering fine ales, home cooked food and comfortable accommodation to a loyal, repeat and desirable clientele. Our vendor clients are now looking to sell the freehold on in order to be able to take life at a more leisurely pace. The business is currently operated by the owners themselves assisted by 1 full and 4 part time members of staff. Sitting at the heart of the local community the business offers weekly entertainment, karaoke, quiz night, steak night and a highly popular Sunday lunch. It also hosts many charity functions and shows major sporting events throughout the year. We are advised that accounts declare takings of £181,016 (incl. Vat) to end 31st March 2018. This was achieved on a trade split of 85% Wet sales ; 9% Food sales & 6% Accommodation. New owners could continue to operate the business using the same formula or may wish to take the business to the next level. In our opinion this could be achieved by marketing the letting accommodation on national letting and tourist websites running alongside the introduction of teams and an annual beer festival. The property was viewed by Richard Fletcher who would be delighted to discuss further details and can be contacted. Viewing appointments must be made via Guy Simmonds. Note: Size quoted is usually the Total Useful Floor Area taken from the EPC and is for guidance purposes only and no responsibility is assumed by Guy Simmonds for the accuracy. If size stated =1m2, this is because no measurements are available at this time. (I) These particulars are a general outline for the guidance of intending purchasers (or lessees) and do not constitute an offer or contract, nor any part of an offer or contract. (II) All descriptions, dimensions, distances, maps/plans, references to condition, trading figures and other items in these particulars are given as a guide and no responsibility is assumed by Guy Simmonds for the accuracy of individual items. Intending purchasers (or lessees) should not rely on them as statements of representations of fact and should satisfy themselves as to the correctness of each item by making independent enquiries. (III) Intending purchasers (or lessees) should make their own independent enquiries regarding the use of the property, necessary permissions for use and occupations, potential uses and any other matters affecting the property prior to purchase. (IV) Guy Simmonds do not make or give whether in these particulars, during negotiations or otherwise, any representation or warranty in relation to this property. No responsibility is taken by Guy Simmonds for any error, omission or mis-statement in these particulars. Guy Simmonds do not warrant the accuracy of any accountancy information supplied and purchasers are advised to take independent advice in order to satisfy themselves. (V) Guy Simmonds are unable to give any warranty as to the working order of any apparatus, equipment, fittings or services associated with the premises and therefore, cannot verify they are in full working order. Purchasers are strongly advised to obtain specialist reports prior to exchange of contracts in order to satisfy themselves. (VI) All statements and descriptions are made without responsibility or warranty by Guy Simmonds, the vendors or lessees. Neither do Guy Simmonds nor the vendors/lessees hold ourselves responsible for any expenses whatsoever incurred by applicants inspecting Businesses which may be sold or withdrawn, to include travelling, valuation/survey, legal fees etc. (VII) No person in the employment of Guy Simmonds has any authority to make or give any representation or warranty whatever in relation to this property. (VIII) It should not be assumed that the contents of any photographs are included in the sale. (IX) All prices quoted are excluding stock at valuation. Property descriptions and related information displayed on this page, with the exclusion of Running Costs data, are marketing materials provided by Guy Simmonds, and do not constitute property particulars. Please contact Guy Simmonds for full details and further information. The Running Costs data displayed on this page are provided by PrimeLocation to give an indication of potential running costs based on various data sources. PrimeLocation does not warrant or accept any responsibility for the accuracy or completeness of the property descriptions, related information or Running Costs data provided here.